Bus from Kuala Lumpur to Merlimau is the most important direct express bus service for those who are working and studying in Kuala Lumpur, with their hometown in Merlimau. They prefer to take direct bus from Kuala Lumpur to Merlimau is because passengers can save their time to travel to Malacca to take transfer shuttle bus or taxi to Merlimau. Mayang Sari Express is the only bus operator offers bus service from Kuala Lumpur to Merlimau. Mayang Sari Express is one of the major bus companies with great reputation in Peninsular Malaysia with its headquarter in Muar, Johor. Mayang Sari Express only provides 4 daily trips operating with standard 40 seater coach from Kuala Lumpur to Merlimau. The first bus to Merlimau departs from Kuala Lumpur in the morning at 8:30am. The last bus leave Kuala Lumpur to Merlimau at 8:30pm. In between, there are 12:30pm and 4:30pm bus service to serve passenger from Kuala Lumpur to Merlimau. The duration from to Merlimau takes about 2.5 hours from Kuala Lumpur depending on the road traffic condition. Even though travel from Kuala Lumpur to Merlimau is just a short journey, washroom break will still be given upon request from the driver during the journey. The bus depart from Kuala Lumpur will pick up all the passengers from Kuala Lumpur Terminal Bersepadu Selatan (TBS). Upon reaching Merlimau, the bus service will terminate at Merlimau Bus Terminal. The bus fare from Kuala Lumpur to Jasin is reasonably charge RM 16.00 for adult and RM 12.00 for child. 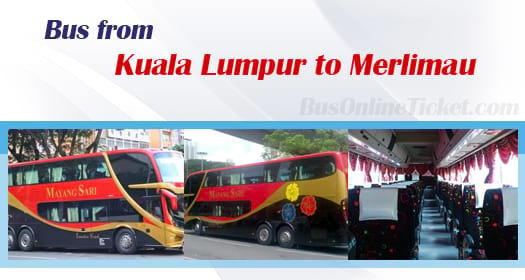 Booking your bus ticket from Kuala Lumpur to Merlimau at BusOnlneTicket.com is easier than you think. It can help you to save time and avoid travelling all the way to the bus terminal to buy ticket from the counter. You can compare and book train, bus, and ferry ticket anywhere with just one click search at BusOnlineTicket.com.